Overall, though, it's hard to escape the suspicion that the Note 7 is a better phone for the money. But it's too early to say for sure. Bookmark this page and come back when the Note 7 hits the shelves; we'll update the article with a definitive verdict once we've had some more hands-on time. Overall, however, things are quite complicted. Design-wise, the Note 7 has more sensible dimensions and better one-handed experience. Both come off as exquisite, though the 6s Plus appers to be more considered, with cleaner lines and more symmetric look all-around. On the display front, if you're fortunate enough to get a Note 7 unit with a well-balanced display (we assume this means most units in the US, but we can't be fully certain), then things would be pretty much on par (provided you're using the Basic screen mode on the Note). In case you're not so lucky, however, and get a Note 7 with a display that is way off (such as one of the two Note 7 units we got; probably most international ones), then the iPhone 6s Plus will consistently deliver the better viewing experience. A better display, better battery life with fast charging and wireless charging capabilities, and better handling experience. The return of expandable storage and dust and water resistance only makes the deal sweeter as well. While adamant fans of either will have a hard time making the switch to the other, the Galaxy S7 Edge is likely to be the clear winner for anyone who’s not set on either of these particular devices. If you are to embark on snowy adventures and you intend to use your smartphone as the designated camera - then any of these high-profile smartphones will do the job quite well. If you are pixel peeping, you may find few pros and cons on each, but at the end of the day, none of this will matter when sharing on social networks as they downsize the images anyway. The Apple iPhone 6s Plus price is rock steady for a simple reason - demand for it is just as steady. Apple is coming out of its shell a little bit, we get more RAM, ad blockers and higher resolution camera, which erodes the feature gap between iOS and Android. The Samsung Galaxy Note5 is sailing stormy seas - first Samsung delays the wide launch, then it runs into issues with the redesigned S Pen, all the while current Note users ask for their microSD slot back. The feature-packed era has come to a close though, it's all about the experience now, never mind the specs behind the curtain. Spoilers ahead! Voting is now closed, but you can still go to Page 2 and pick your favorites with a mind clear of brand preconceptions and promises. Below the phones behind the letters A, B, C and D are revealed as well as the winners. There were a lot of correct guesses in the comments, well done readers! It was the Apple iPhone 6s Plus, which was behind the label 'A', 'B' was the LG V10, 'C' - the Microsoft Lumia 950 XL and finally, 'D' - the Samsung Galaxy Note5. On the Android side of things, the Apple iPhone 6s Plus has good competition in the form of the Samsung Galaxy S6 series of phones. If productivity is what you are after, the Samsung Galaxy Note 5 priced around Rs 64,000 for the 64GB variant is another option to consider. We have to still test the Google Nexus 6P and the Sony Xperia Z5, which also offer top of the line feature sets at much lower prices in comparison. It's become old hat to declare the latest iPhone the best one to date, and that's again true of the iPhone 6s Plus. Of course, that's how it should be when a company updates its flagship product. The question is, how much better is it than the previous generation? There's no simple answer, though we'll do our best to sum things up and provide one. The longer we think about it, the clearer it seems that the race between Android and iOS, Samsung and Apple, the Galaxy and the iPhone is now the closest it’s ever been. Samsung deserves praise here: it is the one that has made big leaps in design, camera, battery life and charging, screen quality and even ease of use with the cleaner TouchWiz. We wouldn't recommend any phone in 16GB, so go for the 32GB Nexus 6P or 64GB iPhone 6s Plus. The iPhone is the better device, in terms of both software and hardware (and blending the two together). But the Nexus 6P isn't a bad phone by any means, and it offers enough functionality to make most people happy. You are getting a lot more for your money with Google, in terms of screen size, resolution, RAM and CPU performance. How this stacks up to form an end-user experience will become clearer in long-term testing, but on paper at least Google is throwing a lot more down than Apple, and charging a lot less. The iPhone 6s Plus takes the crown as the largest, fastest iPhone to date, but it's not a whole lot more improved over last year's model, and 3D Touch is yet to prove itself. The camera is stellar though, and with OIS included that works on video too, it may be worth opting for over its smaller sibling. But for everyone else with regular sized hands, unless you really want to pay the premium for the Plus, we'd suggest sticking with the regular iPhone 6s - or at least look at rival phablets. With all of this in mind, it's up to you to decide which handset suits your needs better. Truth be told, you can't go wrong with either, but you must consider that both phablets serve different types of users. Thus, those who want an elegant and reliable phablet for consuming multimedia, making mobile payments, and playing games with silky-smooth framerates will find the iPhone 6s Plus fantastic for their needs. Power users, though, might prefer the LG G4 for its competent multitasking, file format freedom, the camera's Manual mode, and the ability to add a microSD card or replace the battery on a whim. And if you also happen to be price-conscious, this is another point of interest for LG's hero phone. Funny, the iPhone 6s Plus and the Samsung Galaxy S6 edge+ are probably two of the best phones to get right now. Two amazing pieces of technology but pretty much incapable of changing anyone's mind. Both devices are really trying: Samsung is no longer putting function before aesthetics and has given up traditional advantages such as memory expansion and a removable battery. Apple too has broken a long-standing taboo - large screens. Finally, on the 4K video test the iPhone 6s Plus is in disadvantage as it has a forced software stabilization all the time and thus it has a narrower field of view. The Galaxy's video has more detail while still capturing more objects in the frame, which made if a favorite among 81% of our readers. The Moto X Pure blasts off at $399, which is almost half of the iPhone 6s Plus price. If you can live without the innovative interaction options that the 3D Touch display on the iPhone brings, and with worse pictures at night time, Motorola's phone should suffice for most, if not all of your phablet needs. It also lets you customize its appearance while ordering till the cows come home. The Moto X Pure Edition is easily one of the most affordable flagship smartphones currently out there, and for just $400, you can get yourself a completely customized device. The iPhone 6s Plus, on the other hand, with set you back $750 for the 16 GB base model, and pricing goes up from there, based on your storage needs. The iPhone 6s Plus is definitely not cheap, but you do have the option of picking it up at a subsidized rate through network carriers, an option that isn’t available with Moto X Pure Edition. So, twelve months on would we recommend the iPhone 6 Plus? Well, it may lack some of Apple's latest features such as 3D Touch and that upgraded camera, but it's still a great performer that now boasts an even better user experience thanks to iOS 9 (now that the bugs are being dealt with). If you demand a big-screen experience but can't quite muster the cash for the 6s Plus, this is still a fine alternative. So there you have it for this in-depth look at the Moto X Pure Edition vs Nexus 6! If you want the purest Android experience possible, the guarantee of quick updates, and a large canvas on which to play on, then the Nexus 6 continues to be a great choice, especially given the price drop associated with the launch of its successor. On the other hand, the Moto X Pure Edition also promises a similar software experience, with some great enhancements, along with the availability of microSD expansion. The Moto X Pure Edition holds the edge by virtue of being the newer smartphone, but regardless of which way you decide to go, you are going to come out a winner. Thus, if you aren't already too invested in iOS or Android, just enter the store, grab the phones, and pick whichever you think looks better and fits your palm and pocket well – you can't go wrong with either one. If you have to switch sides, though, better stick with your current ecosystem, as neither one is that more enticing than the other to warrant the swap, unless you are really curious. Last but not least, don't forget that the $750 iPhone 6s Plus starts you off with 16 GB of storage only, while the basic 32 GB Note5 can now be had for $650 or even less, which can also tip the scales for you. If you’re not a fan of more sizeable phones then you should forget about the iPhone 6S Plus – they don’t get much bigger than this. You'd be better off considering the 4.7-inch iPhone 6S (below) instead. However, if the larger form factor isn't an issue for you then the iPhone 6S plus is an excellent phone and one that I fully recommend. But this year more than ever, the iPhone is much more than the sum of its parts. Its challenges –a steeper learning curve, less elegant software, and a year-old hardware design– are counterbalanced by great battery life, an incredibly deep ecosystem of apps and services, a new and innovative interface and a solid camera. The iPhone 6s Plus is not the most exciting smartphone of 2015 –not by a long shot– but it wasn’t meant to be; it was meant to be the best (oversized) iPhone yet. While that won’t always be enough to keep the iPhone afloat in a sea of ever-more-capable, ever-cheaper competitors, “the best iPhone yet” is more than enough to keep Apple healthy – and the iOS faithful happy. For all other aspects of the iPhone 6s I’m going to refer you to my review of the iPhone 6s. That’s because, to all intents and purposes, the iPhone 6s Plus is identical. It may have a larger screen and a slightly better camera, but the rest of the package is the same – same ion-strengthened glass, same new iOS 9 features, same Touch 3D. Just like its more compact cousin, the iPhone 6s Plus brings superior imaging, 3D Touch, a beast of a chipset and double the RAM and those surely make it a worthy upgrade. Plus, the screen size and resolution help Apple compete in a segment clearly dominated by Android. The iPhone had been stuck on 8MP since the 4s and meaningful strides in the camera department were long overdue. So, the 6s generation has finally made it into double-digits. It's just that the new 12MP shooter isn't the ultimate in smartphone imaging, with or without OIS. Unsurprisingly, the iPhone 6s Plus is a great smartphone both its own right as well as compared to its immediate predecessor and the competition. Although we're not convinced by Live Photos, everything else about this phone is useful and well-designed – especially 3D Touch which we expect to become standard on all iOS devices sooner or later. Another year, another new iPhone – that’s just the way the world runs. Being the year of the ‘S’ for Apple, it means that the we’re given the same looking iPhone from the previous year, but with some upgraded hardware in the necessary areas, so that includes the processor, camera, and much more. In true fashion, the iPhone 6s Plus hits the mark in those crucial areas, cementing itself as a strong competitor in the field for those who happen to love, you know, big phones. The “S” releases of the iPhone have never been the ones consumers raved about. Maybe it was the fact that it was harder to tell what had changed, a fact owing nicely to the idea that the body stayed the same, and that the features were more incremental than anything else. Apple likes to say, however, that some of its most important changes came from its S releases, generations that are basically half steps before the company goes back and redesigns the body, the thing that most people know and recognise as being totally new. For instance, Apple’s voice assistant “Siri” came from an S release, and the fingerprint reader came from an S release. Those are some early impressions for now. I'll be testing other things like performance, video stabilization, and battery life in the coming weeks. If you're and Android user curious about iOS 9 and the iPhone 6S, what would you like to know about it. And if you just got a new iPhone, what has your experience been? I'd love to know--leave a comment below! Obviously, the new iPhone 6s Plus is better than the 6 Plus. The "s" models are usually iterative updates to the previous model, fixing several pieces of the model released the previous year. While the outside form factor remains nearly the same, the internal specification improvements and added functionality make the iPhone 6s Plus a significant update to the iPhone line. Other than these, you're looking at a carbon copy of the larger member of Apple's most successful ever iPhone generation, with a slender (and now reinforced) body and a giant screen. Pretty much all of the things that made the iPhone 6 Plus a bestseller still apply, with the added wow factor of 3D Touch, Live Photos, better cameras, a faster chip backed by more RAM and, apparently, a faster and more reliable edition of Touch ID (a winning prospect for those who, like me, find the fingerprint sensor in the iPhone 5s a source of despair). This is a speed demon with a charming bag of new tricks. Apple has moved the game forward with the iPhone 6s Plus. Its use of 3D Touch is particularly exciting – we can't wait to see what third-party app developers do with it. Its new cameras are also fantastic, improving significantly on what were already very respectable snappers. It's also faster, and generally slicker in day to day use. We'll reserve judgement until we've spent more time with the handset, but at the moment the 6s Plus is a fantastic top-tier handset that new buyers (if not 6 Plus upgraders) should definitely consider. Just like the original, the iPhone 6S Plus is the big-scale Apple phone for the kind of user who uses two hands and isn't bothered about the weight or space needed to fit one into their pocket. Although most S upgrades bring minor tweaks, the iPhone 6S Plus sees notable advantages from 3D Touch. Whether that's to write on that large screen, or by hard-pressing to interact with iOS 9 in a slicker and quicker fashion than before, it's the S model to buck the annual trend. No matter what people say, size matters. And because of its sheer screen size, the iPhone 6s Plus does tremendously well at showcasing some of Apple’s new hardware features. It’s particularly good for 3D Touch, and has a great screen for showing off those 12Mp photos and 4K video you can now shoot. Perhaps best of all, it enough battery life to see you through a day and then the morning afterwards. Apple's second generation phablet was always going to be an incremental upgrade, so it's no surprise that a number of comparisons can be drawn between the iPhone 6S Plus and its predecessor. Side by side they're practically impossible to tell apart, but it's what you can't see that makes the difference. A combination of excellent power and an exciting new technology in 3D Touch means the iPhone 6S Plus is set up for the future much better than the 6 Plus. The iPhones 6S Plus is the best Apple phablet around. That's not exactly difficult when it's only got the 6 Plus as competition, but Apple's done enough to upgrade the 6S Plus in some key areas. There won't be enough improvements and new features for some, and it's fair to say if you currently have the iPhone 6 Plus there's no need to upgrade to the 6S Plus - unless you just want bragging rights for the latest tech in your pocket. 86% Opium für die Generation Tick? Model: The Apple iPhone 6S Plus is for users wanting the Apple experience but with larger screen real-estate. With smartphones becoming larger at the moment, screen size is all the hype as it ties in with video entertainment and capability. Design-wise the Apple iPhone 6S Plus mirrors its smaller brother, the Apple iPhone 6S, with its solid series 7000 aluminium chassis and colur schemes. There are the usual four colors to choose from; silver, gold, space grey and rose gold. The 192 g smartphone comes with 3 storage options; 16, 64 and 128 GB. The beautiful 5.5 inch Retina HD display with 401 ppi has dual-domain pixels for wide viewing angles. This display is also claimed to be one of the toughest in the industry and has 3D touch capability. At the core of the Apple iPhone 6S Plus is an A9 processor with an embedded M9 motion coprocessor. Both, the 12 MP iSight camera with f/2.2 aperture and the secondary 5 MP FaceTime HD front camera are able to capture stunning images. Other features include Touch ID, A-GPS and iBeacon microlocation. 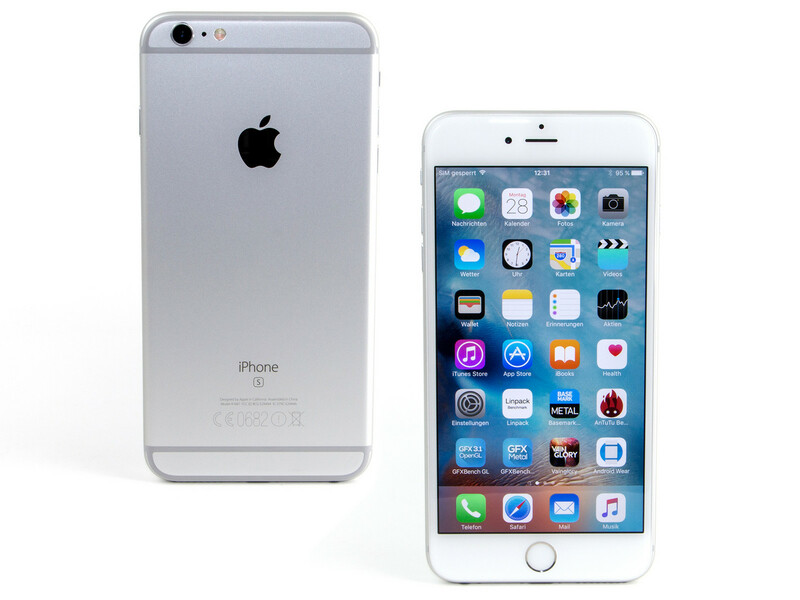 The Apple iPhone 6S Plus comes with a built-in Lithium-Ion battery with up to 10 hours of internet usage. 89.07%: There do not exist many models, which are rated better. The most ratings get ratings, which are a bit worse.